Chipman Hill Suites was born when Susan Fullerton, a preservationist with an entrepreneurial spirit, had a vision to rescue and restore the heritage properties at 5 and 9 Chipman Hill by renovating these two formerly private homes and creating twenty fully equipped, self contained suites to cater to visitors to the city who required longer-term accommodations and to whom a comfortable "home away from home" would have a strong appeal. 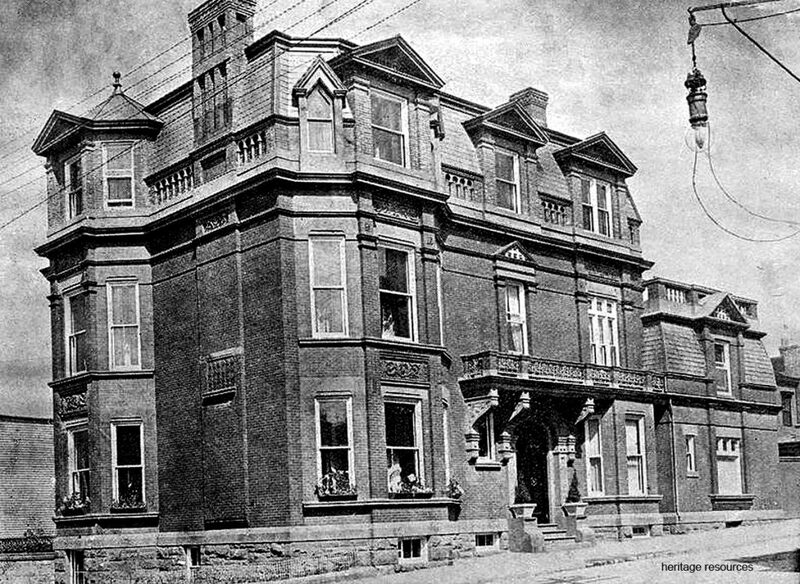 From that first purchase, it soon became obvious that Susan had hit upon a niche market that had been waiting to be filled, and along with what quickly became a heart driven passion to restore and care for some of Saint John's most iconic landmark properties, fourteen buildings have been purchased, renovated, and taken on the Chipman Hill Suites mantle. Currently, there are nine properties with a total of eighty-seven suites in which we host a combination of nightly, hotel-like stays and longer-term monthly stays. Three of our buildings, 1 Chipman Hill (Pratt House), 5 Chipman Hill (Senator Dever House), and 9 Chipman Hill (Yeats House), are on the Canadian Register of Historic Places. Click on any of the key dates in the Chipman Hill Suites timeline below to learn more about the history of our magnificent properties. The two communities known as Carleton and Parr Town joined together in 1785 to become Canada’s first incorporated city, taking the name Saint John from the great river (which was named by Samuel de Champlain in 1604). Saint John served as the capital of New Brunswick for a brief period, before the capital was moved up river to Fredericton. Unlike St. John’s, Newfoundland, our city uses the full spelling of “Saint”, and some residents are highly offended when it is abbreviated! For more on the interesting history of the Port City, click here. The properties at 1 and 5 Chipman Hill were built for brothers-in-law named Aaron Hastings and Robert Armstrong. Unfortunately, by 1860 both men had gone bankrupt and lost their homes in a public auction. The Chipman Hill buildings played an important role as part the boundary of the area destroyed by the Great Fire of 1877. The hard work that was put into saving them from the flames broke the fire and helped prevent its spread to Union Street. 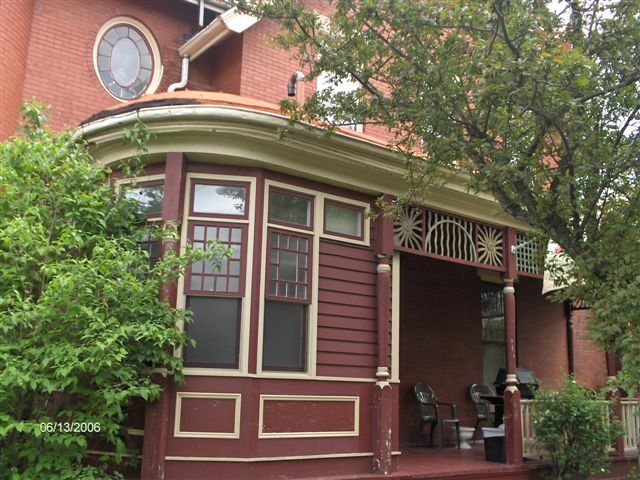 You can find an extended history on these two properties and more on our relevant Property pages. This third in the trio of properties on Chipman Hill was built in 1860 for Deborah Brinley Hazen, whose funeral was held from the home in 1873. For more on the interesting history of 9 Chipman Hill, please click here. The Great Fire of Saint John was devastating to the city. It began when a spark fell into a bundle of hay in a storehouse located in the vicinity of the present day Market Square. 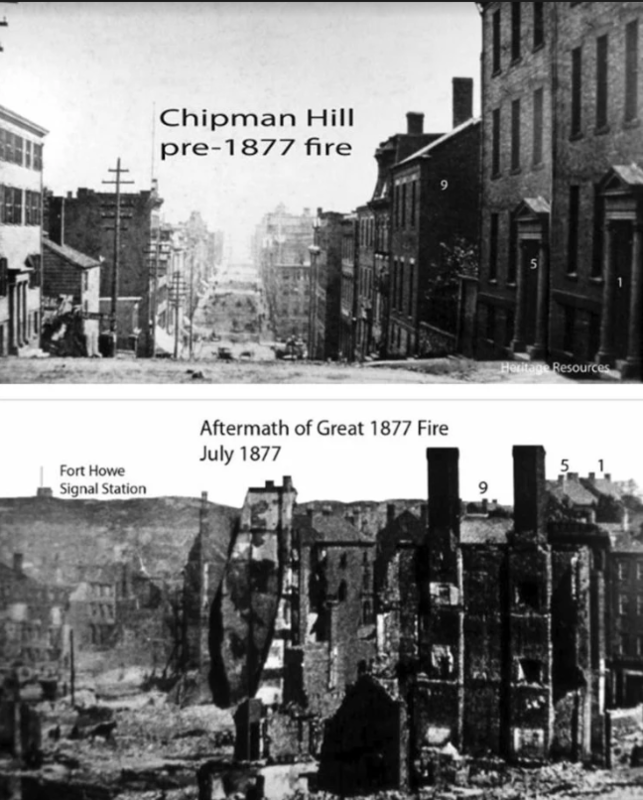 The buildings at 1, 5 and 9 Chipman Hill were considered instrumental in preventing the spread of the fire to Union Street. Click here for a link to a brief and interesting article on the fire, as featured on the New Brunswick Museum website. Look closely at the photos on the left for the 1, 5 and 9 which indicate the Chipman Hill properties. 145 Germain Street is located in the heart of the uptown action, just about at the corner of Princess and Germain Streets. It’s easily within a few minutes’ walk of numerous restaurants, bars and shops – the newest and hippest along with the older and more established! 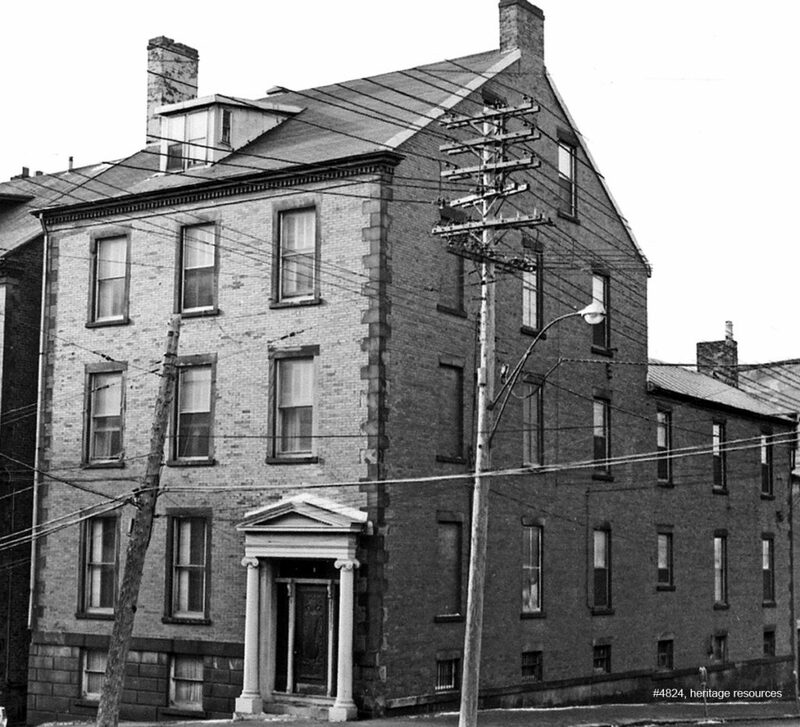 The three-storey Second Empire building at 145 Germain Street was built in 1888. One of the earliest residents was Harry R. Lordly, whose father operated the A.J. Lordly Co. dry goods establishment, but for much of its history, the building contained medical or dental offices. Dr. Percival L. Bonnell operated his Bonnell Dental Infirmary here from 1939 to 1970. Percival was a veteran of the First World War, drafted in 1918 under the Military Services Act, 1917. He was already in dental practice and served with the New Brunswick Regiment Depot Battalion in Sussex until he was discharged in March 1919. Dr. Bonnell was quite an accomplished singer; newspaper archives are full of accounts of him singing at various church and community events. Articles usually describe him as having exceptional singing ability, and he also played the piano. 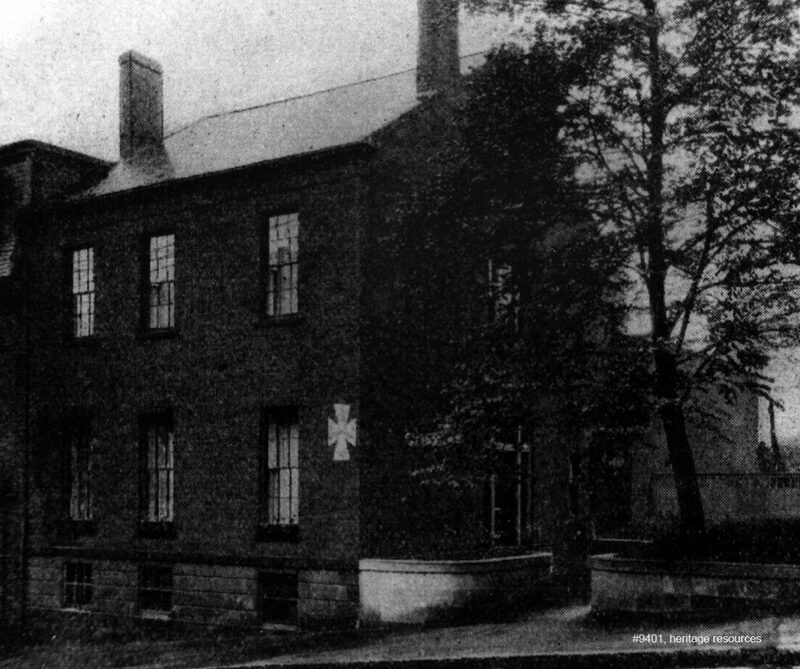 Other dentists practiced at this infirmary as well, but the building remains most commonly known in historical circles as the former Bonnell Dental Infirmary. The property at 75 Coburg Street, at the intersection of Coburg and Garden Streets, was built circa 1889 for local lawyer James Stratton. 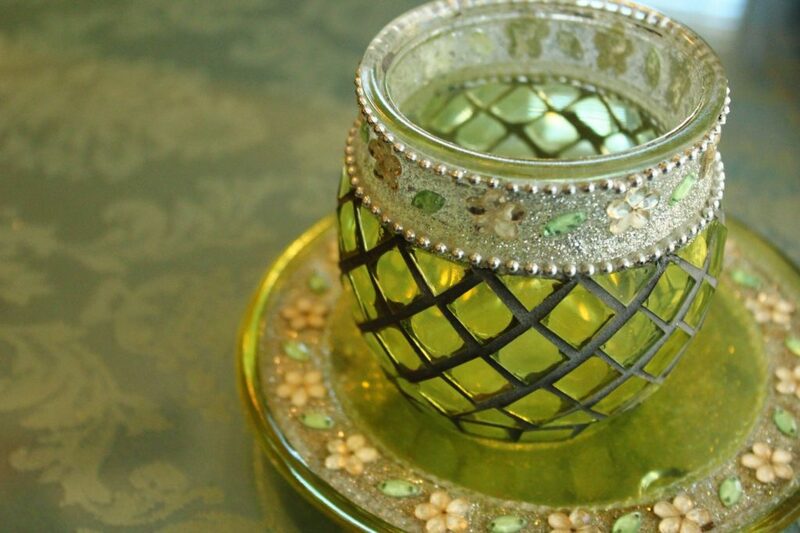 It was later purchased by Dr. Murray MacLaren in 1897. 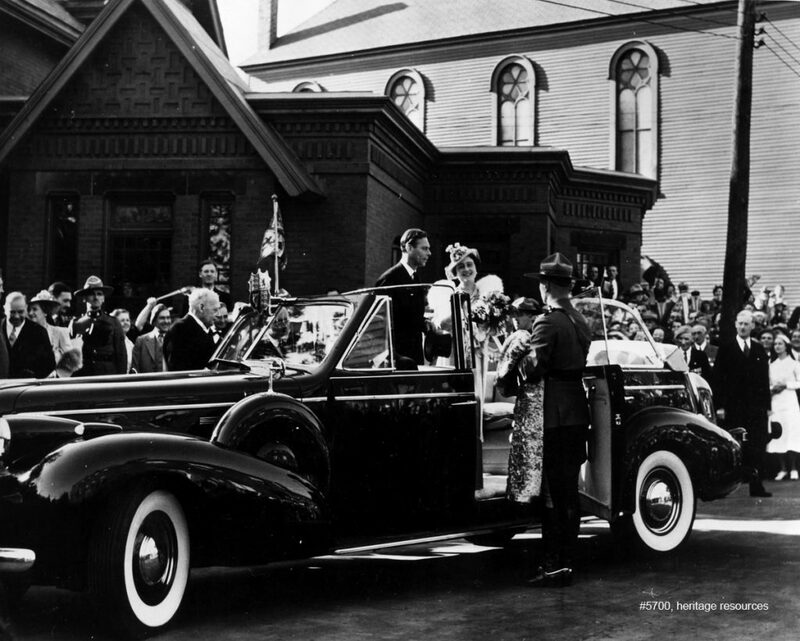 Dr. MacLaren eventually became the 18th Lieutenant-Governor of New Brunswick, serving in that capacity from 1935-1940. This stately home was built for Dr. Walker W. White and his large family. 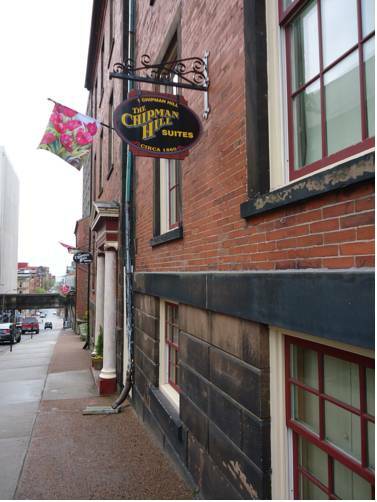 It is truly one of Saint John’s iconic heritage properties, and Chipman Hill Suites is proud to be its caretaker. Before the brand new Irving Oil Home Office was constructed, the property loomed large on the corner of Princess and Sydney Streets. Although it now appears somewhat diminished alongside its big new neighbour, it remains a grand and glorious example of Victorian era properties in the city. The elegant homes on Mecklenburg Street were built during a flurry of extravagant design at the end of the 19th century. 2 Mecklenburg is also known as Thomson House and was built circa 1895 for Robert Thomson, whose father started the William Thomson shipping company around the year 1848. On tour in Canada in an undertaking in the build-up to World War II to emphasize the independence of the Dominion of Canada from Britain, King George VI and Queen Elizabeth visited every province and the then Dominion of Newfoundland. 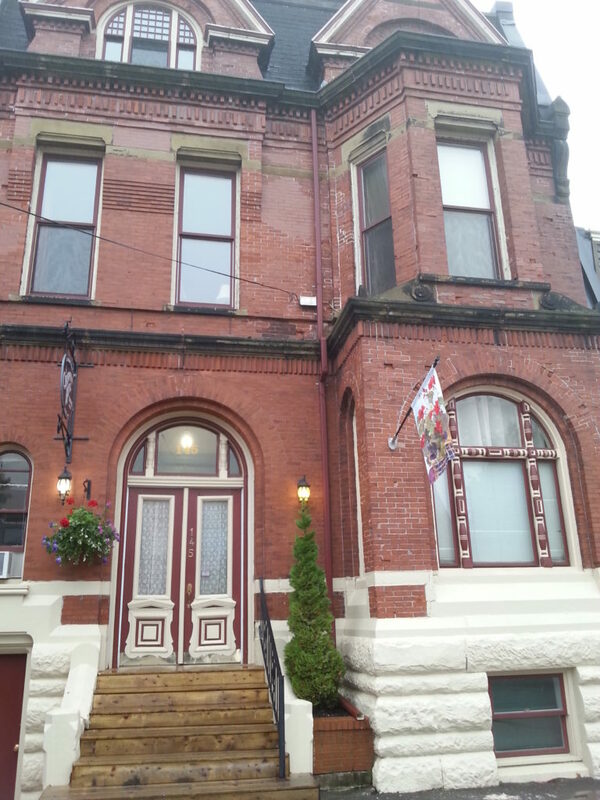 75 Coburg Street was the residence of New Brunswick’s Lieutenant-Governor at the time, which is why it was featured as a stop on the royal tour. 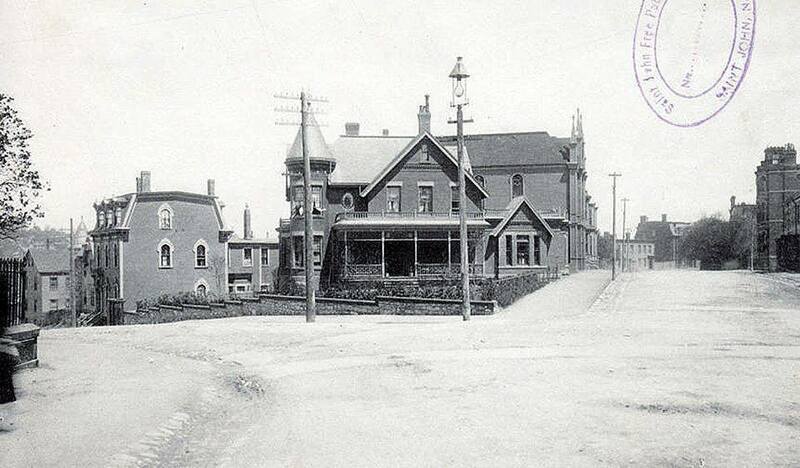 Before Chipman Hill Suites, there were “Susan’s Victorian Properties”. That’s right… many people might not realize it, but Chipman Hill Suites had a predecessor! 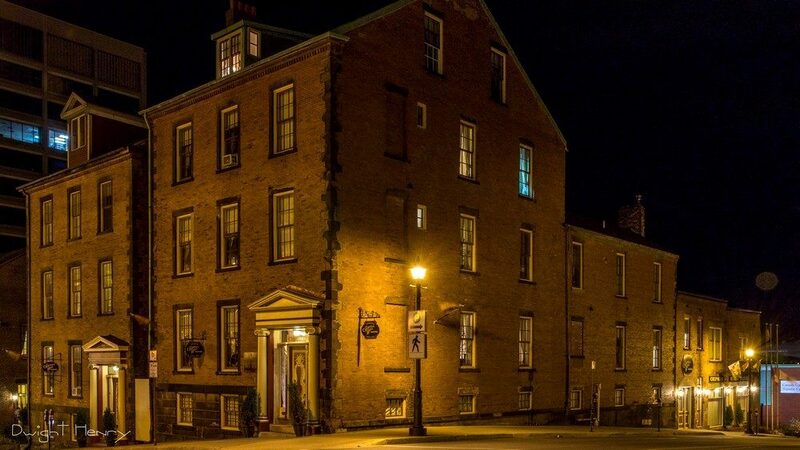 Susan Fullerton made her foray into the accommodations industry with properties in Saint John’s southern peninsula not currently part of the Chipman Hill Suites collection. 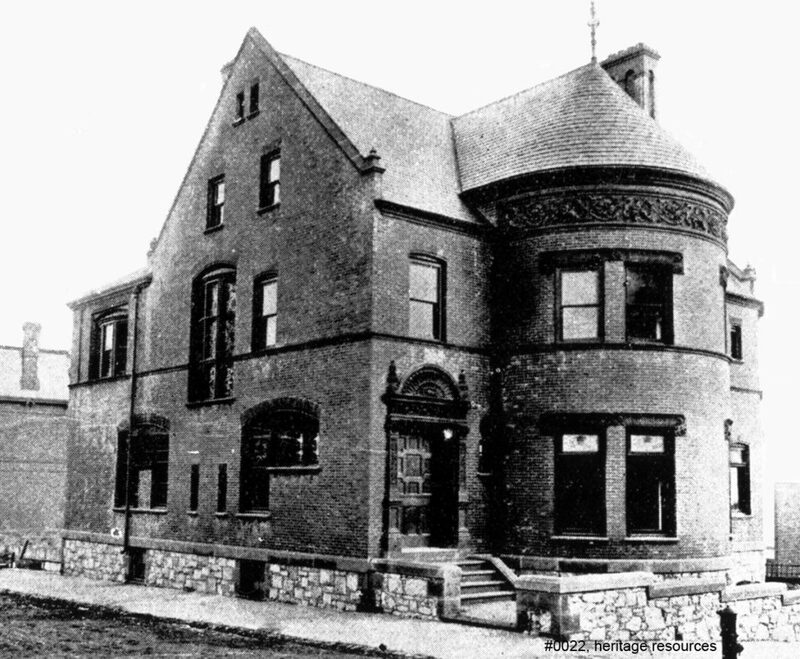 The former Bonnell Dental Infirmary was the first building purchased as one of Susan’s Victorian Properties that is still a part of the Chipman Hill Suites collection. 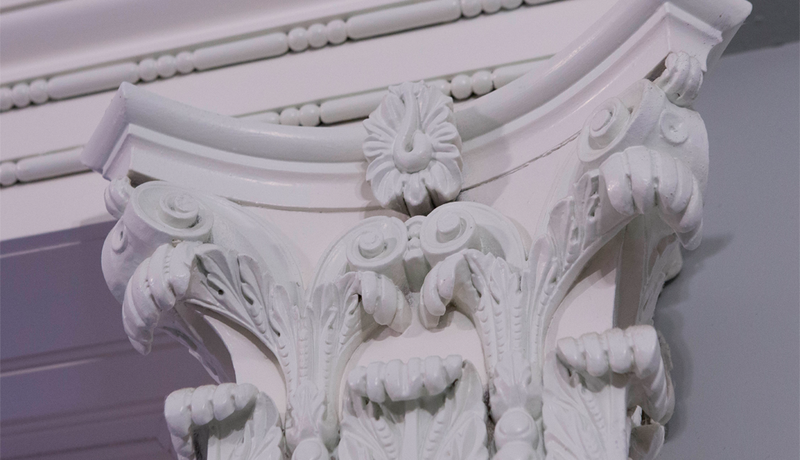 Renovations were undertaken and it was put into service within the same year as purchase. As with all of the Chipman Hill properties, maintenance and building improvements are continuous at 145 Germain Street. This property now features our newest suite… a small but well-equipped basement level bachelor unit used primarily for monthly stays. In the middle of an ambitious three-year stretch, Thompson House, as it is also known, joined Susan’s Victorian Properties a year after 145 Germain. The required work was done and tenants were in the building within the same year as purchase. Although purchased in 1994, it would be several years before the properties at Chipman Hill were open for business. Whereas Germain and Mecklenburg had already been converted into individual rental units at the time of their purchase, the Chipman Hill properties needed more extensive renovations to produce the suites the owner desired. The Chipman Hill properties were not turned around and ready for rental quite as quickly as the properties at Germain and Mecklenburg Streets. Chipman Hill Suites was officially born with the opening of 5 Chipman Hill. 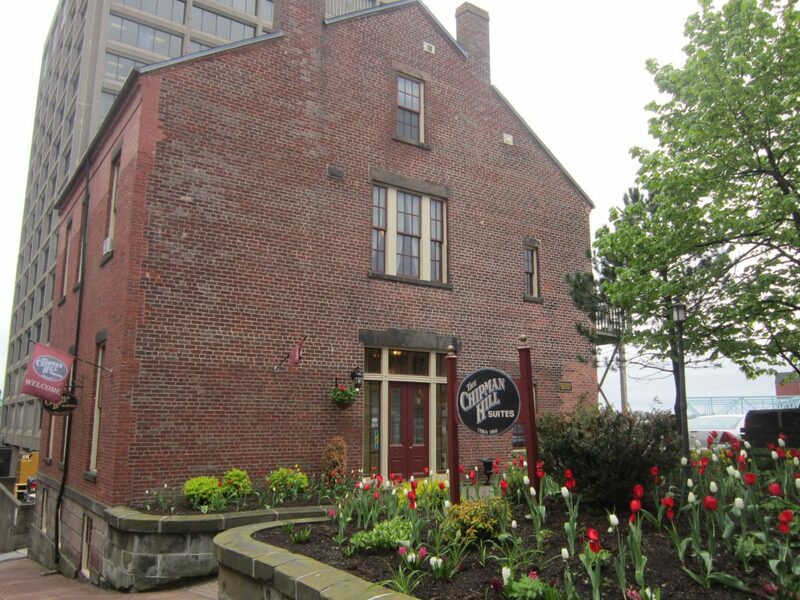 The buildings that had previously been operated under the umbrella of Susan’s Victorian properties eventually melded with Chipman Hill Suites and the name “Susan’s Victorian Properties” was retired. As was the case with the Germain and Mecklenburg properties, 75 Coburg Street was ready for service within the same year it was purchased. 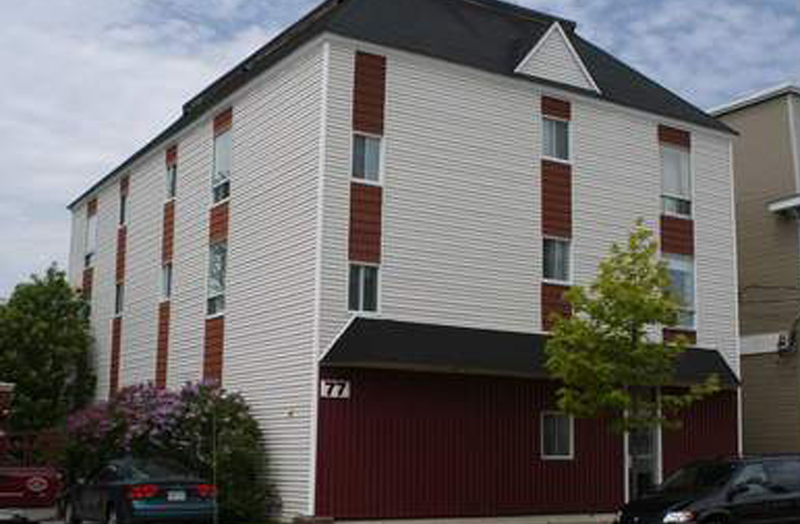 The property at 77 Coburg had already been functioning with eleven self-contained rental units at the time of purchase, so the work required to make it available as a Chipman Hill Suites property was mostly cosmetic, and it was ready for rental within the same year. By the time these two addresses were added to the Chipman Hill Suites roster, Susan had found her groove and the properties were renovated and accommodating guests within the year. They are the babies of the Chipman Hill Suites family, as they were the last properties to be added to the business. 2007 is the last significant date on our timeline, but we continue to make history as we share our magnificent heritage properties with guests from all over the world and all walks of life.